When you believe in a product, it makes it a lot easier to "sell". I've been using Skylum's Luminar photo editing software now for almost two years. You can check out my latest review of Luminar, but I thought it would also be good to show how I personally use the app to edit my own vacation and travel photos. 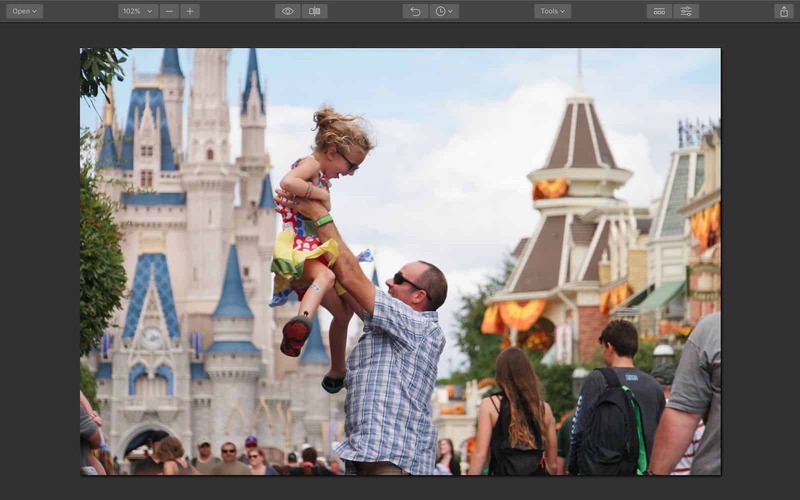 Here's a little bit of Luminar 2018 "in action" editing two of my very favorite Orlando theme park photos I've ever taken. All images are originals taken by Dadtographer. These photos were edited using JPG source files. Please don't use our photos without permission. Hopefully you had a great vacation this year, and came back with lots of images of the happy times and wonderful places you visited. Now that the gloom of fall and winter is upon us, it’s the ideal time to bring a little sunshine back into your life by editing your vacation photos. A bit of editing will really make your images shine, and it doesn't have to take hours to accomplish. I’m going to show you today how to give your vacation photos some dazzle with Luminar 2018 (af). 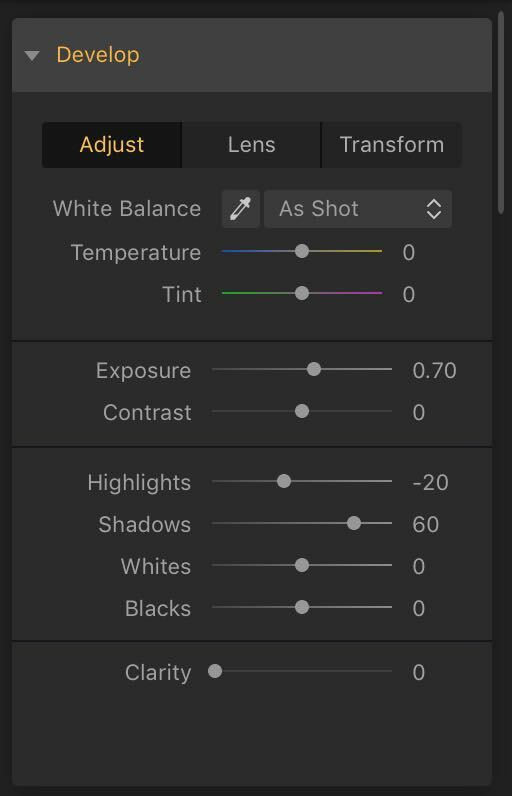 I’m going to edit the first image by making manual adjustments, and the second by using Luminar’s powerful artificial intelligence filters to get great results. A few minor corrections is all this beautiful photo really needs. Here you see one of my very favorite photos I took while at Walt Disney World's Magic Kingdom. The photo was taken on popular Main Street USA, very close to Cinderella's Castle. A dad had reached down and picked up his daughter and tossed her into the air. I snapped this photo at just the right moment. It's a great photo, but it needs just a little adjusting before I'm ready to call it ready to share. Ok, first, the photo is a little too dark, especially in the shadows. I’m going to use some shadow adjustments by moving the shadow slider to the right, the highlights down, and the exposure up a little. The reason I don’t just crank up the exposure slider is because I would lose all detail in the clouds, and give the image a ‘washed out’ look. I dropped the highlights so as not to lose too much detail in the clouds. Once I had done this, I adjusted the curve ever so slightly at the bottom (shadow) end as I felt that the image still needed brightening a little. The next thing I did was to add an adjustment layer, and change the blending mode to Soft Light. I did this to add some color and contrast, but 100% opacity is way too much, so I dropped it to 25%. This gave the image some tone and richness. The next thing I did was to give it just a little touch of denoise filter. 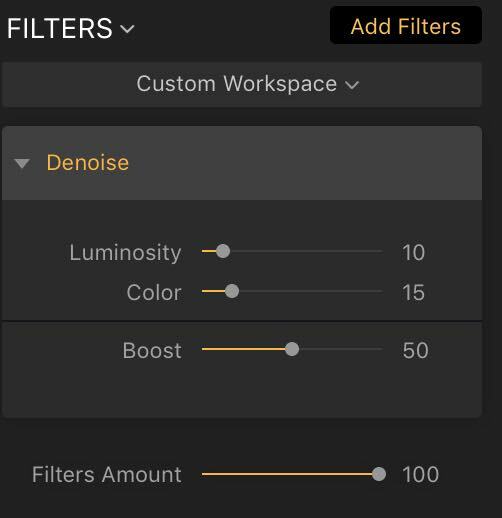 This filter needs a light touch, as too much denoising can make your images look flat and without detail. Finally, I did some saturation and vibrance adjusting. If you only bang up the saturation slider, it quickly becomes overpowering, but if you add more vibrance and less saturation, skin tones tend to look more natural, while other colors pop. 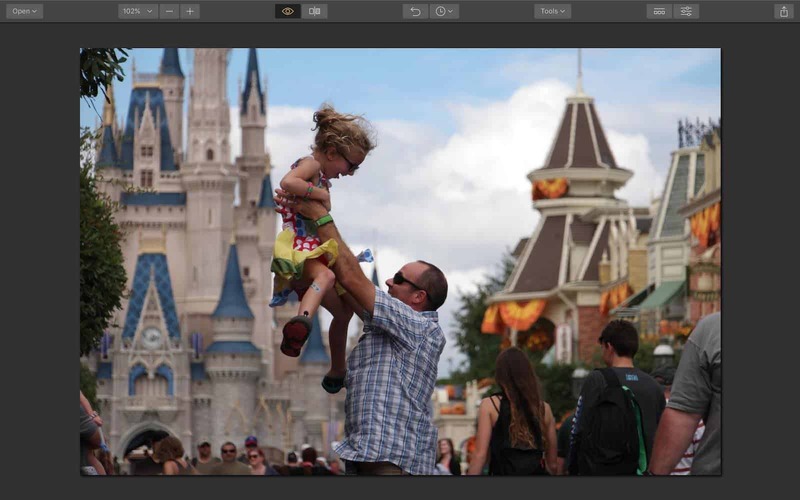 Here are screen shots of the settings I used on the "Main Street" Magic Kingdom photo edit. Click any image below to see a larger version. You could, of course, go much further with editing this, such as adding some more localized contrast, or dodging and burning, but I just wanted to show you how quick and simple this edit was in Luminar 2018. It took me less than 2 minutes to make these adjustments manually. Luminar's Artificial Intelligence (AI) examines the unique properties of each image and applies the appropriate edits. 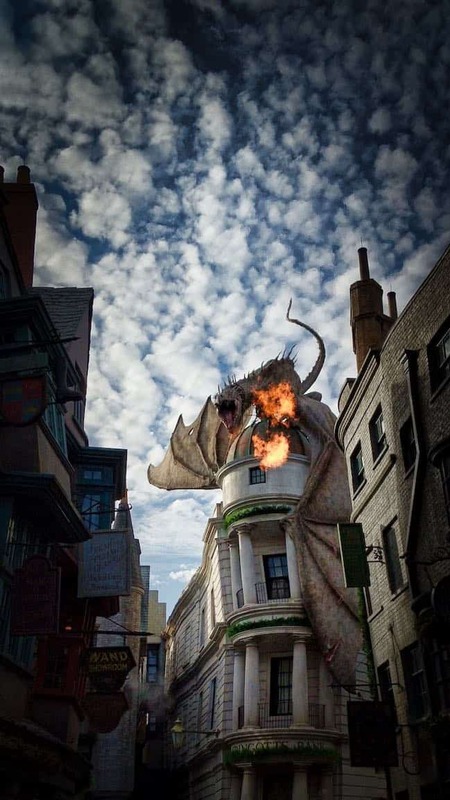 This awesome photo from Universal Studios Orlando's Diagon Alley has a lot of potential. 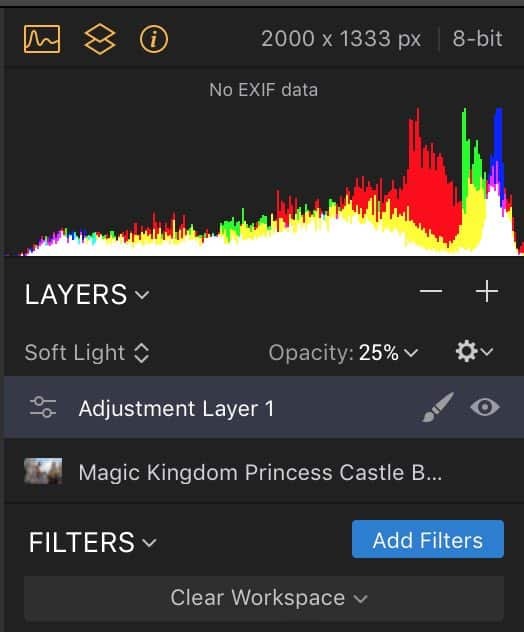 If you’re not sure what to do when it comes to applying manual edits and filters or you don’t have time to do manual adjustments (ahem, me), Luminar 2018 (af) has two really clever filters that use artificial intelligence to evaluate and adjust each of your images. Every image is unique, and AI Accent and AI Sky Enhancer treat them that way – it’s not just a quick fix solution, but a tailored adjustment. 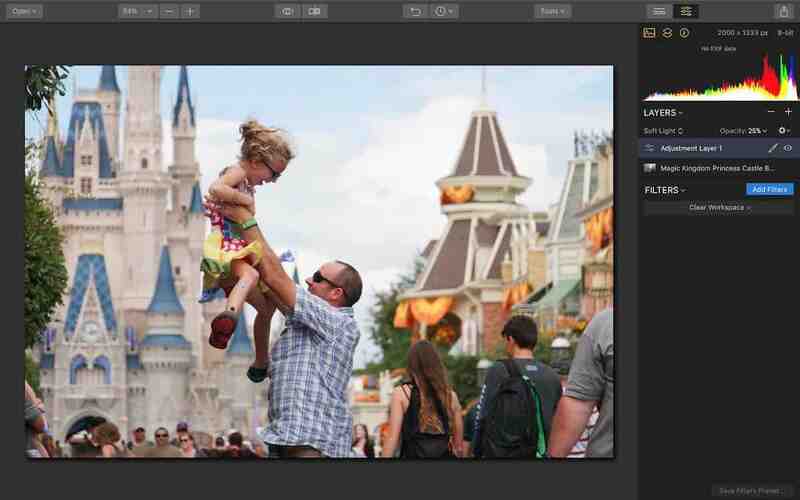 You retain control over how strongly you want these filters to come through in the images by using the sliders. Let's get started editing another image, this time using Luminar's AI features. This time, I will use an unedited photo taken with my Google Pixel 2 XL from Diagon Alley in Universal Studios Orlando. The source file for these edits is a JPG file taken right off my phone. I'm going to first simply apply Luminar's AI filter to the photo and see what it does "out of the box". The second image you see here shows what the AI did on its own. No other edits were made to the photo, other than adding the AI filter and setting it up to 100 on the slider. As you can see, the AI edits are pretty good in this case. The photo definitely has more "pop" than it did before the edits, but it's not quite Instagram ready just yet. I'm going to crop this image to remove the crowds of people from the bottom of the image to make it feel like it's just us, the sky and the dragon. 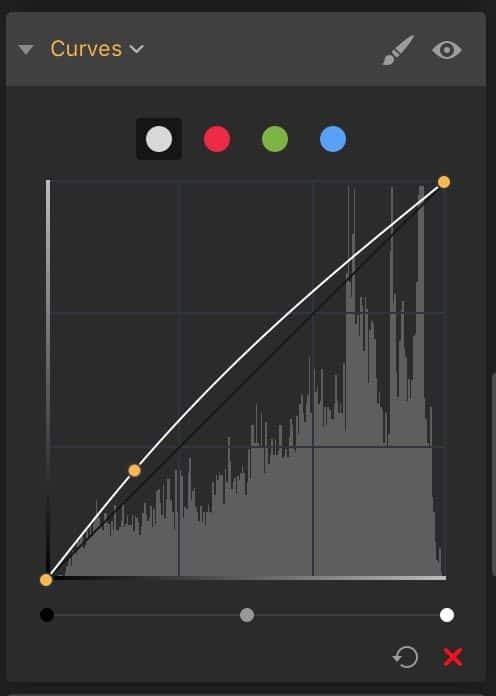 The "crop" feature is found in the "Tools" menu drop-down in the top-right corner of the editor. I'd like to keep the same aspect ratio as the original, so I'm going to select "Original" in the aspect ratio drop-down in the top-left corner of the crop editor view. From there, I grab the thick white bar on the bottom of the photo and drag it straight up until the crowd is no longer visible and hit the "Done" button in the top-right corner. Check out the next screen shots to see how I applied this crop. Putting the focus of the photo where it belongs - on the dragon and his fire. The next edit this photo needs before it's ready to go is to apply what's called a post-crop vignette. A vignette will apply shadowing around the outside of the image, pulling more focus into the center, which is the dragon in this photo. Applying this edit will really emphasize the subject and make it feel even more like it's just you and the dragon. That's how it felt when I was there taking the photo. You can't "feel" from a photo, but what I felt when I took this was extreme heat. I was surprised it was so warm! The people in the crowd around me (now cropped out), gasped when the dragon unleashed his fury. I want this photo edit to feel as close to that experience as possible. I'll add the vignette filter and set it to -82 to really add a decent amount of darkness to the outside of the photo. I'll also slide the size of the vignette down to 22. I'll update the Feather setting to 67. That will make the blending of the vignette less noticeable and put a more gradual touch on the contrast between the center and the edges. Lastly, I will use the Place Center button to put the center of the post-crop vignette right on the open mouth of the dragon. I think the last thing that would make this photo awesome is a little more detail, so I'm going to add the Structure filter and bump it up, just a bit. I don't want to apply too much structural enhancement here. I want enough to bring out the micro details of the sky and the fire especially. Check out the settings I used to make these edits in the next screen shot and then the final edited photo "before and after" comparison below. You can't "feel" from a photo, but what I felt when I took this was extreme heat. I want this photo edit to feel as close to that experience as possible. Here's the final edit of my "Diagon Alley Dragon" photo. It took a little longer to edit the photo than normal, but only because I was taking screen shots along the way. Editing this photo using AI and then applying a few of the additional "manual" edits afterward would have taken me about 90 seconds to complete. The finished product on this photo is great - I think it really emphasizes the experience of the moment compared to the original photo. We applied the AI filter, cropped out the crowd, added a post-crop vignette and punched up the structure (detail) just a bit. This photo is definitely one of my favorites from this past summer! Photo editing is very personal. What style of edits do you like most? Leave a comment below!